My husband and I have long wanted to visit more cities in the north of Germany, especially Düsseldorf. I read last year in a Germanwings magazine that Düsseldorf has an area known as "Little Tokyo" with tons of authentic restaurants and shops. This is in large part because Düsseldorf reportedly has the highest population of Japanese citizens in Europe, thanks also to the bi-weekly flights between the city and Tokyo. With our interests piqued, we decided to use the long Easter weekend as an opportunity to see if the city lives up to its hype. We arrived in Düsseldorf in the afternoon on Friday. We stayed at a B&B Hotel because they're cheep and accept dogs (though I appreciate nice hotels, I don't spend a lot of time in them and would prefer to spend my money elsewhere when I travel). We used the train system to get around, and spent most of our days walking from shops to cafés or restaurants. Since we had our dog, we couldn't really go in any museums or churches, but this wasn't a problem. We were there for one thing and pretty much one thing only: Little Tokyo. Because it was Easter weekend and most shops (and some restaurants) close on Good Friday and Easter Sunday, we decided to spend the bulk of our time in Little Tokyo on Saturday. The area encompasses roughly a half dozen blocks around Immermannstraße near the Hauptbahnhof. 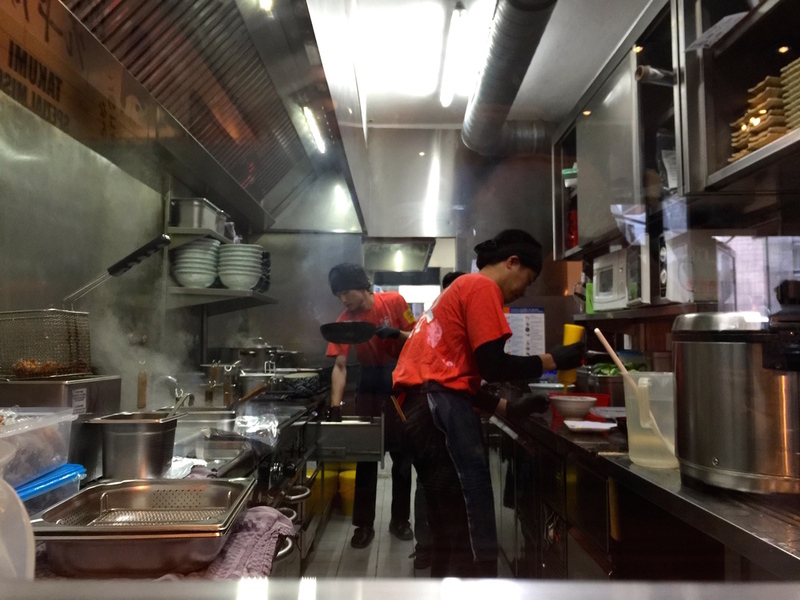 Our first stop on Saturday was Takumi, a ramen shop on Immermannstraße. We decided to arrive just when they opened for lunch at 11:45, and it was a good thing we did. The line had already formed halfway down the block with eager customers. The line, it seemed, was a fixed feature of the restaurant, because every time we passed the restaurant during our three-day stay, there was a line. Thanks to our forethought, we were quickly seated alongside mostly Japanese and Chinese customers at the tiny bar surrounding the glassed-in, open kitchen. The walls and furniture were of a dark wood paneling, and the room was plastered with specials from the menu written in Japanese. We could have easily forgotten we were in Düsseldorf and instead thought we'd been transported back to Tokyo. The big draw at Takumi is their traditional-style ramen made with noodles shipped in fresh from Sapporo. I've tried making ramen at home before, and even though I can get the broth to taste about right, the dish just isn't the same without the right noodles. Takumi clearly has them: the noodles are soft, but springy with a good bite to them. I had my favorite, the tsukemen, which really showcased the noodles nicely. The dipping sauce was rich and salty, and it even came with a pot of noodle water to dilute the sauce down into broth for drinking after I'd finished my noodles. The ramen eggs were also of note as they had the perfect soft-cooked center. Sadly, I forgot to take a picture before I chowed down. 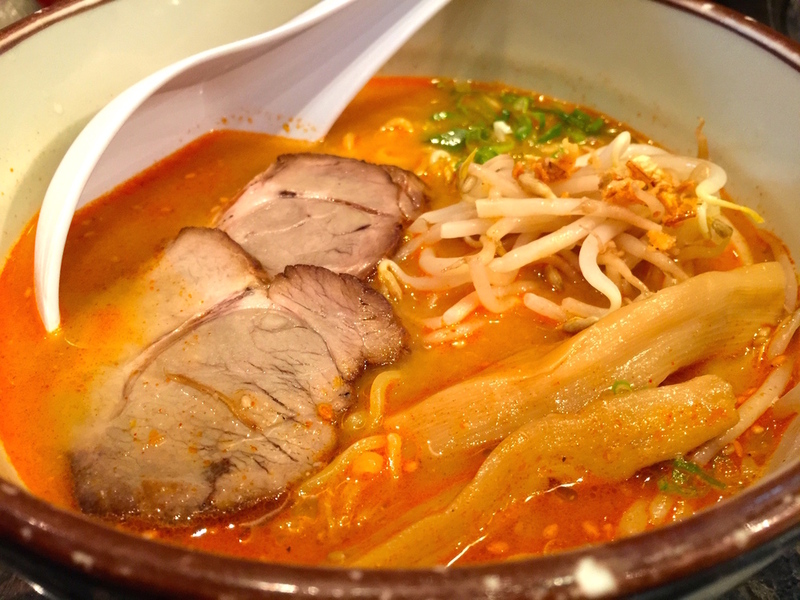 Matt did, however, remember to snap a picture of his oro-chon spicy miso ramen, which had a nice heat balanced by the creamy miso. 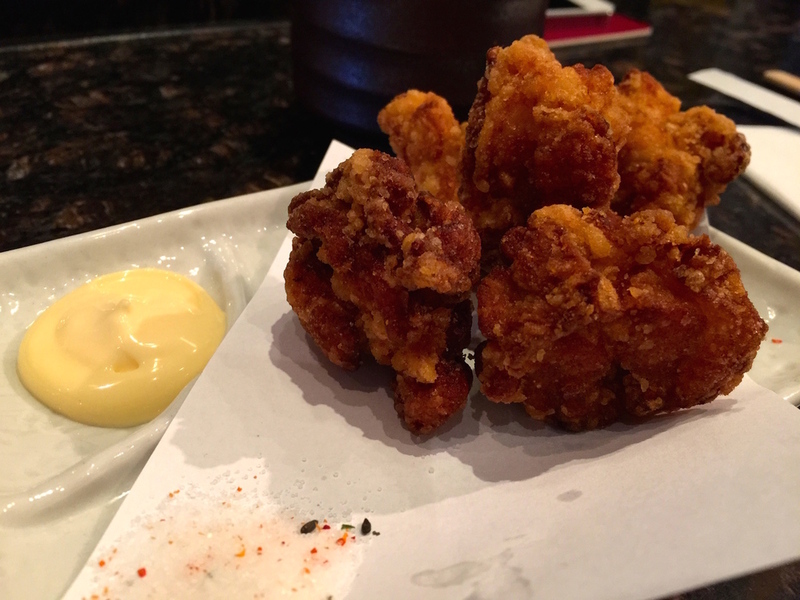 We also tried the crispy karaage (fried chicken) appetizer and washed down our meal with Kirin (on tap!) and hot green tea. Our meals were so good, that we decided to return again for Sunday lunch. Once again the restaurant was packed, and once again we had an amazing meal of gyoza, teriyaki chicken, traditional shoyu ramen, and miso ramen. The teriyaki chicken was particularly tender with a yummy homemade sauce. As a side note, we saw another popular ramen shop called Naniwa that is supposed to be delicious as well, though less traditional. We would have tried it, except they don't allow dogs. We were also so pleased with Takumi, that we didn't feel the need. Next to Takumi, we found a Japanese bakery called Bakery Taka. We stopped by after our ramen on Saturday and loaded up on melonpan, anpan (red bean), lemon-melonpan, matcha-melonpan, and even pumpkin-anpan. They had tons more flavors, too, and a large selection of big, squishy Japanese-style loaf breads. Across the street was another shop I really liked called Waraku. They specialized only in onigiri -- Japanese rice ball cakes -- and had a couple dozen different flavors in the window. Though we were full of ramen, we picked up four flavors and snacked throughout the day: karaage, tuna and mayo, chili shrimp, and curried ground meat. The packaging was super neat, making these an easy, healthy fast food option. We didn't go in the bubble tea store next door called Sphere Bay, but I wished on Sunday that we had. They had an advertisement for matcha soft serve ice cream that looked incredible! Next time for sure. There are also several fun shops around the area, including Kyoto next to Takumi. The shop sell lots of pottery, kitchen supplies, kimonos, and bento boxes. We also spotted several Asian markets, a manga shop, a Japanese book shop, and some other nicknack shops. You just have to wander around Immermannstraße and Klosterstraße a bit and you'll find it all. We also checked out the Muji store (think a Japanese-style Ikea) along the main shopping street known as the Kö and picked up a couple of things for our house. We probably could have spent the full three days eating at just Takumi, but I would have felt that we were limiting ourselves a bit. We branched out by trying a couple of other good places that we found on Yelp, both of which turned out to be winners. The first was Casita Mexicana. This was actually our first stop on Friday when we arrived, because it was open all day from lunch through dinner, and we got in and settled at an awkward time (around 3pm by the time we left the hotel). The restaurant is a bit south of the center on Bilker Allee, but was easy enough to get to on the tram. To start, we ordered the guacamole and chips. 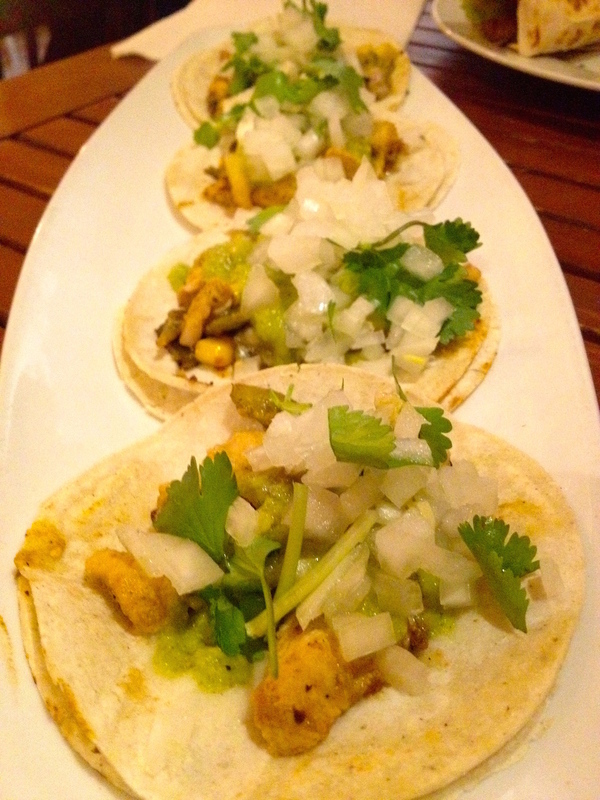 The portion size was larger than at Mezcal^2, but still just right for two people. The guacamole was tart with fresh lime, cilantro, and onions, and though I'm pretty sure the chips were bagged, they were of the high-quality kind that we get at the Markthalle. For our entrée, we ordered the mixed platter to try a bit of everything (it's for two or more people). 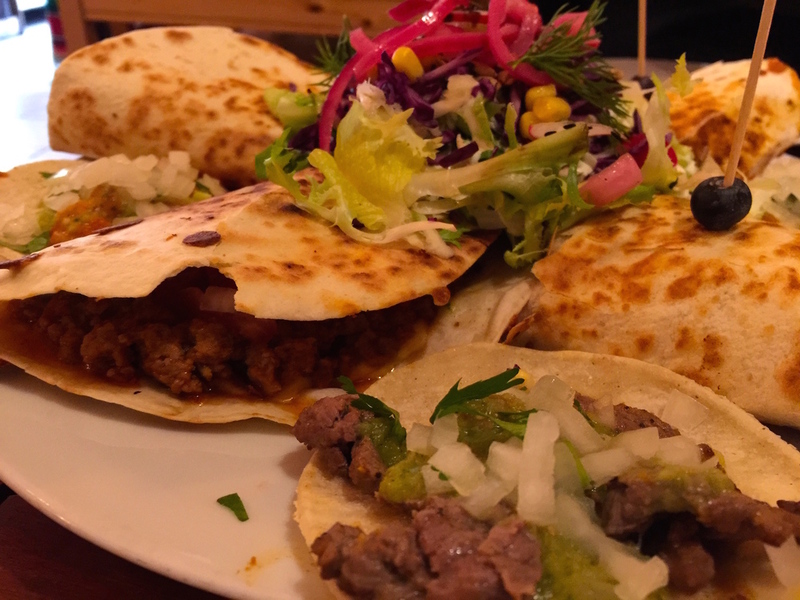 The platter came with a chef's choice of beef pico de gallo tacos, spicy shrimp tacos, a chicken chipotle burrito, and a mixed ground meat quesadilla. It's hard to say what my favorite was. The quesadilla meat had a savory creamy, slow-cooked flavor to it that I really liked, but the tacos had the perfect texture and taste to their doubled corn tortillas. The food and drinks were so good that we stopped by a second time for more tacos and burritos on Sunday before our train left in the evening! Then on Saturday night we went out for burgers at Stier Royal on Zimmerstraße (just three blocks down and one over from Casita Mexicana). We both agree that these were easily the best burgers we've had in Germany. The patties, though they were still packed a bit too much, were definitely homemade and pretty close to American burger patties. Matt's "Jucy Lucy" burger stuffed with truffle camembert was indeed juicy with a light truffle flavor. However, I think my Cheese 'N' Onion special with balsamic mayo, arugula, marinated tomatoes, gorgonzola cheese, raspberry-rosemary chutney, and crispy paprika onions won hands down. The other showstopper at Stier Royal were the fries. They makes both homemade fries and sweet potato fries, and offers a number of sauces on the side. We decided to go for the five-sauce flight to try a few different kinds: curry mango sauce, burger sauce (mayo with horseradish), truffle mayo, chili mayo, and BBQ sauce. They were clearly homemade and we enjoyed them all, but the truffle mayo was gone first, followed by the curry mango and BBQ in a close tie for second. We even saw the table behind us order three helpings of truffle mayo! Matt's Allgäuer "Edelweissbier" was also particularly good and made a nice complement to the meal. Sadly, the third place that I wanted to try -- An Banh Mi -- was closed for the long weekend. They have some pretty good reviews on Yelp, and I'd be interested to try some other types of banh mi after our recent foray into the cuisine. Oh well, perhaps next time. Though I try to plan out a couple of good meals by searching Yelp, various blogs, TripAdvisor, and the like before we leave, I also like to keep us open to some surprise finds. One of those was definitely Yomaro, a frozen yogurt shop in Carlsplatz. As we were walking through the Atlstadt on Friday, we kept passing people with big white cups and heaps of what looked like soft serve ice cream. We walked in the direction that they seemed to be coming from until we came across Yomaro and realized they were eating not soft serve, but frozen yogurt. Since this was the trip of repeat favorites, we went back a second time on Sunday. I indulged in a smaller, but no less decadent cup of with chocolate bits, amaretto cookies, and a seriously fresh strawberry sauce. I'd have been happy sharing again, but Matt wanted his own cup of white chocolate chips, chocolate chip cookies, and coconut flakes and would not try the strawberry sauce (his loss). The Carlsplatz seemed to be a pretty cool area overall. When we returned on Saturday afternoon for the market we found the usual fruit and vegetable stalls, but also a number of food stands selling German sausages, fresh oysters, pasta, some kind of Middle Eastern cuisine, and more. Had we not already been full of ramen, I would have been happy to have eaten there. Another fun find was the Uerige brewery in the Atlstadt. The brewery takes up the whole block, and you'll recognize it by the lines of wooden tables packed with young people after work drinking "bierchen" or small 0,25L beers. As it was still pretty cold on our trip, I preferred the bar that we ducked into at the end of the row. We stopped in because they advertised craft brew, not realizing it was all part of the same Uerige complex. It turns out the space was mostly taken up by older drinkers, but it was dark and cozy and warmed us up. My Weizen beer was flavorful with hints of clove and lighter fruity overtones. We also snacked on a particularly good currywurst with a homemade sauce. Another place we ducked into to warm up was the Woyton coffee bar near the Rathaus. We had handmade drip coffee of the Zimbabwe and Panama varieties. As a disclaimer, I don't pretend to know a lot about coffee, but I know enough to admit that I don't often drink my coffee black unless it's a good cup. (This is also partially because we have an espresso maker at home and because the coffee at my office is gross.) The coffee at Woyton was made with a drip brew filter, so it was flavorful without being bitter and perfectly drinkable just as it was. Farther down the street we found tons of other restaurants and bars, but they all seemed a bit touristy. The area reminded me of the the city center in Amsterdam with its many "Argentinian" steak houses and loud waiters trying to get you to come inside and sit down for a meal. (I've never particularly liked being told to come to dinner.) We walked through the area to see what it was all about and even stopped for a beer and a taste of Killepitsch (a red liqueur from Düsseldorf) at the Schlüssel brewery, but we tried to spend most of our time checking out the the other quiet corners and parks around the city, of which there were many. Apart from eating and walking, I'm not sure what else we would have done in Düsseldorf. There weren't really any museums or churches that I was interested in seeing, though the walk across to the river to see the sheep along the Rhine was pretty fun (for Leo, too). Yes, I've heard the shopping is great along the Kö, but we're not exactly big spenders and Chanel is not a part of my closet. We spent an hour or two there, but after that we were done. All that said, I think Düsseldorf was fun to visit (two days would have sufficed) and could be an even neater place to live. So what do you think: have you been to Düsseldorf? Do you have any recommendations? Leave them in the comments below.